We run a preset structure of lessons along with the adhoc that can be added as and when. You can see how we structure the lesson types below. Group lessons can be from 3 riders to 8 in a class all working at a similar level. The focus of the instructor goes from rider to rider so you have time to stop and consider the instructions and your results whilst others work around the arena. A semi private lesson will have you booked on with one other rider of a similar level to you. Private riding lessons are one to one. They are the more expensive and we recommend that unless you are aiming to work on something very specific, you try and join a group or semi-private riding lesson. We are very proud of our facilities spanning both fenced in arenas and open field riding. 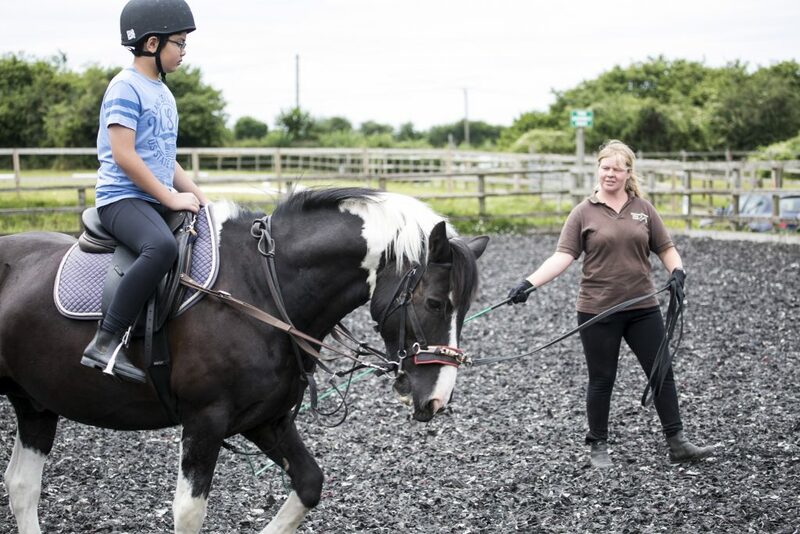 We start children on lead pony rides from 3 or 4 years upwards until they are confident and balanced, have an understanding of “the aids” and are able to rise to the trot. They can begin lunge lessons from 6 years of age, where they can start to learn to ride independently of the reins and stirrups and can start to canter. From here they can progress to riding off the lunge or in a group of similar standard. They need to be able to control the pony to ride with others.